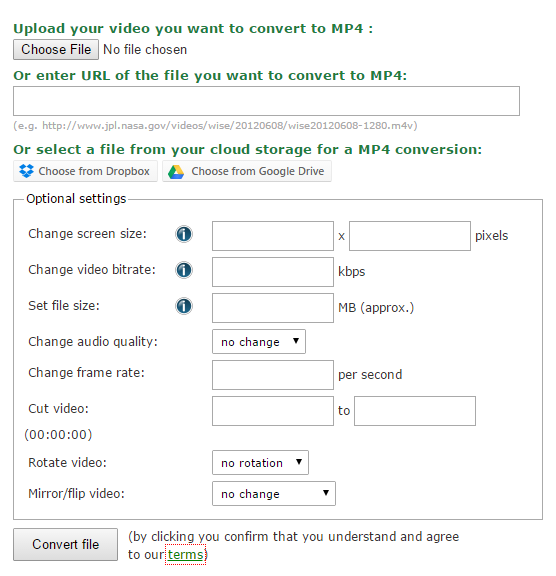 Here we are with the second article of our conversion series and this time we’re going to talk about the cool new kid on the block, .webm, and how to convert it to an .mp4 in just a few minutes. If for some reason you’re passionate about file conversion you can check out our previous article on extracting mp3 from mp4 with VLC. While .mp4 is the most popular video format across all platforms, .webm (also known as the VP9 video codec) has been rapidly gaining popularity as a new format designed specifically for the web. Therefore if you download a video from a website there’s a good chance that video might be in .webm format. If you want to make sure that you’ll be able to play it on any device your best option is to convert that webm file to an mp4 and you can easily do it online in under 5 minutes. As you can see, Chrome and Firefox both support webm (that’s about 50% of the market) and the other browsers are slowly catching up. But let’s get back to the main topic of this guide. A quick Google search for “convert webm to mp4” returns over 1 million results and even if we just look at the first two pages of search results, we’ll see a lot of irrelevant stuff and even some spooky conversion websites. So I chose two that looked decent enough and I’m going to put them to the test, so that you can then choose the one that suits you. And now let’s see how the conversion works with the two online tools I picked. Zamzar is pretty well-known for online file conversion, with over 5 million monthly visitors. Let’s get started and see how the process works and how long it takes. Pretty straightforward, except I can already see that step 3 requires that I enter my email address. I’m not loving that, but I really need to convert this video so I’ll just give one of my secondary emails (I doubt they would’ve reached this level of traffic if they spammed their users, but I guess I’ll just unsubscribe if I’m wrong). After completing all the steps I click convert and the process starts immediately. Three minutes laster I get an email from Zamzar prompting me to sign up to their service. Fortunately I also have the option to download the video without registering so I pick this one instead. I’m redirected to their website where once again I’m asked if I want to sign up, but I choose to just go ahead and download the file. The final result is below for you to judge (ignore the captions saying webm video file, this is now an mp4). The file size went down by 16.2% from 8.16MB to 6.76MB. The image quality is still good but I can see a little more noise especially in the highlights. Overall I’ll give Zamzar an 8/10, mostly because of their process which was a little cumbersome. But let’s move to the next option and see how it fares. Strangely, the resulting mp4 video is 10.1MB, a 23.7% increase over the original webm. Albeit this being 49% bigger than the one obtained using Zamzar, I didn’t notice any difference in image quality between the two (if I must be really picky I think the first one looks a little bit better, but we’re talking super fine details). I could stop here, but since I set out to find the truly best online tool, I’m going to take advantage of online-convert’s option to change the file size to see how the two outputs compare given the same file size. So I went back to the previous page and chaged the desired file size to 6.76MB. To my surprize, that didn’t work at all. In fact, I found out that no matter what custom file size I chose, the resulting file would be (wait for it…) 73.1MB!! Out of an 8.16MB file! Clearly something is wrong with their conversion process, so I’ll just have to settle with the 10.1MB file. Zamzar. Although I hate giving away my email address and the process was 3 times as long, I suspect something is wrong with online-convert’s system that inflates the file size. So for now I’m sticking with Zamzar. Let me know what you guys think in the comments, especially if you’ve found an even better online tool for converting webm to mp4. That’s it for today. Stay tuned for Ep.3 of our series on file conversions. Edit: Ep.3 about converting FLV to MP4 using FFmpeg is here, check it out!